ROGUE shopkeepers who are tempted to sell illegal tobacco are being warned they could face more than a fine but could lose their livelihood. Crooked store owners who sell smuggled or fake tobacco could not only lose their alcohol licence but face huge tax bills from HMRC and closure orders from local authorities or the police for causing a commercial and a health nuisance. Figures show that rogue shops are an increasing problem for illegal tobacco sales in the North East. In 2009, shops were the main source for 1 in 20 (4%) illegal tobacco buyers – but in 2017 were the main source for one in four illicit buyers (23%). Private addresses, or tab houses, were still the main source for 46% of illegal tobacco buyers. In Newcastle, an offending mini-market was made to pay a fine of bill of more than £1m after a series of seizures by HMRC and Trading Standards. And in County Durham, a store was this month shut down for three months having been linked to the supply of illegal cigarettes and tobacco. Fresh is launching its Keep It Out campaign to encourage people in local communities to report sales of illegal tobacco which helps get children hooked on smoking. All people need to do is visit keep-it-out.co.uk/ to report local sales to trading standards with full anonymity. More and more people have been reporting illegal tobacco confidentially since the Keep It Out website was relaunched last October. The website has had over 540 pieces of information about illegal tobacco from the North East and over 1600 from around the country. Ailsa Rutter OBE, Director of Fresh, said: “The trade in smuggled and fake tobacco is linked to organised crime and enables North East kids to smoke. Most people do not want it in their local community and it is great to see more and more people giving information to help keep it out. The Anti-Social Behaviour, Crime and Policing Act 2014 gave local authorities and police powers to issue closures notices for premises. They can also apply to courts for closure orders for up to 3 months. And last year figures from HM Revenue and Customs show bills for tax and penalties totalling £11.5m were issued to individuals and businesses caught storing and selling illicit tobacco more than once. HMRC has long focused on prosecuting shopkeepers for selling illegal cigarettes, but shopkeepers started to keep fewer cigarettes at the premises in an attempt to avoid prosecution. Now investigators examine the frequency and volume of seizures made, as well as other evidence to calculate tax and penalties owed. Owen Cleugh, consumer protection manager at Durham County Council, said: “We fully support the Keep it Out campaign. Illegal tobacco being sold at low prices can draw children into becoming addicted to smoking. It is also a means of organised crime getting a foothold in our communities and can lead to other types of criminal activity. “We are committed to using an intelligence led approach to identify sellers of illicit tobacco and take robust action where evidence brings us to their doors. Councillor Nick Kemp, Newcastle City Council cabinet member for Environment, said: “From a health perspective illegal tobacco undermines efforts to reduce the rate of smoking but it also has other serious impacts on our communities given its links to organised crime. “We take a tough stance on the matter in Newcastle and in partnership with HMRC and Northumbria Police we have undertaken regular operations visiting targeted homes and retail premises resulting in a number of convictions. Middlesbrough Council’s Public Protection Service say they take their role in tackling the supply of illicit tobacco in the town seriously, and officers regularly receive intelligence about where illicit tobacco is being sold from, while surveillance can provide additional evidence, if needed, and multi-agency operations are carried out. Cllr Julia Rostron, the council’s Executive Member for Adult Social Care and Public Health, said: “We are serious about tackling the sale of illicit tobacco in Middlesbrough. We want our communities to be safe and illicit tobacco brings wider, serious crime issues into our neighbourhoods. It also undermines every public health measure in place to reduce smoking which we know will kill 1 in 2 smokers. 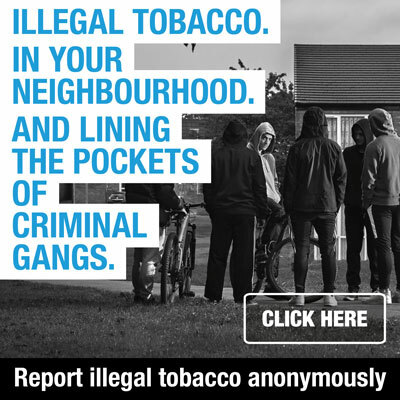 “Our message to the Middlesbrough public is very clear – illicit tobacco may be cheap but it costs your local community by bringing in other wider organised criminal activity which you do not want in your neighbourhood. Eden Noblett, Assistant Director, Fraud Investigation Service, HMRC said: ““Shopkeepers selling illegal tobacco deprive the UK of money which should be used to fund our vital public services, and undermine honest and hardworking traders. Illegal tobacco has helped over half of underage smokers in the North East get hooked on smoking. Figures from the 2017 North East Illegal Tobacco Survey found 55% of children aged 14-15 who smoke say they buy illegal tobacco from sources like “tab houses” and shops – while 73% say they have been offered illegal tobacco. As well as helping children to start smoking, people supplying illegal tobacco are often involved in drugs or loan sharking. Buying it means supporting crime and can bring children into contact with criminals. Anyone with information about houses, shops, pubs or individuals selling illegal tobacco can give information online at www.keep-it-out.co.uk or by calling the illegal tobacco hotline at 0300 999 00 00. All information will be treated anonymously. 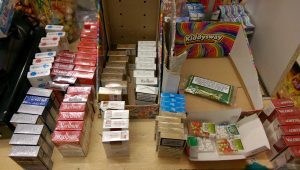 County Durham – a County Durham shop was last week shut down for three months having been linked to the supply of illegal cigarettes and tobacco. The store, at Middle Street, Blackhall Colliery, was closed following an application by Durham County Council after more than £3,000 illicit tobacco was seized. The shop was ordered to close by magistrates at Peterlee as a result of an investigation into the supply of illegal tobacco by trading standards officers. Newcastle – the owner of a Newcastle mini market was handed a bill totalling more than £1m (£1,098,488) after investigations revealed he made around £2,500 a day from the sale of illicit tobacco over a five-year period. 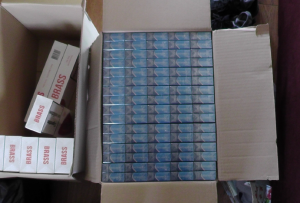 21 seizures have been carried out with 133,379 cigarettes and 86.79kg of hand rolled tobacco seized. 10 prosecutions have been taken resulting in fines and community orders. 6 premises have been closed for a minimum of 3 months using Closure Orders. 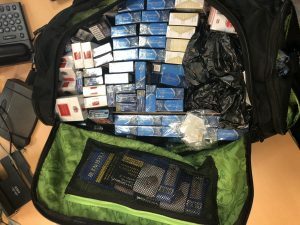 Action was taken by HMRC against people supplying illicit tobacco in Middlesbrough and wider, and this resulted in 8 people being sent to prison for a total of 26 years. If I give information will anything be done? How does it affect me if I don't smoke? 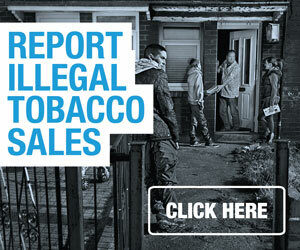 Where is illegal tobacco being sold? How can I prevent criminals from taking advantage of young people? Aren't sellers just trying to make a few quid? This campaign is being managed by Fresh with funding support from Local Authorities.